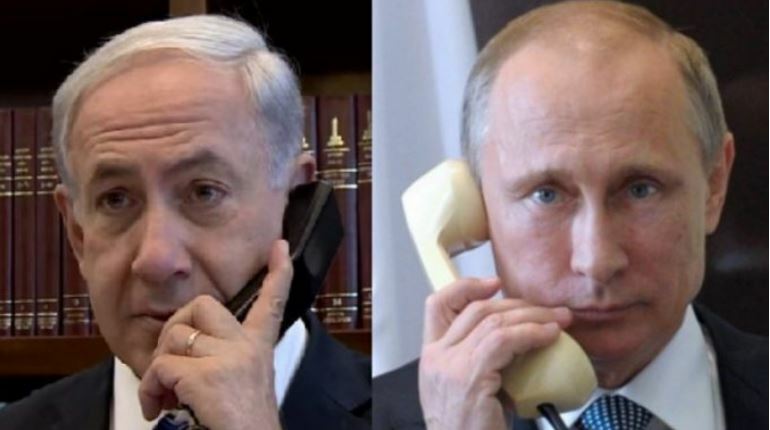 ‘Vladimir Putin warned Binyamin Netanyahu to discontinue Israeli strikes in Syria because they may rock the Assad regime [backed by Moscow] and insisted on Israel respecting Syrian sovereignty and security. By this warning, Russia clamped down on the freedom the Israeli air force had hitherto enjoyed in Syrian air space for striking hostile elements, primarily Iran and Hizballah. Previously, Israel had kept Russia appraised of possible action against Iranian military activity inimical to Israel’s safety. As well as his knowing the existence of many sources of the nerve agent toxin Novichok, the release of which necessitated continued closure to the public of many locations within the city of Salisbury, that most sensitive working relationship meant Netanyahu refrained from joining the wide, international censure of Russia over the poisoning incident. It’s no wonder their villainous and deeply sinister schemes countenance their Syrian vassal’s continued commissioning of war crimes. Israel’s reported military strike in Syria hit President Vladimir Putin at a highly vulnerable moment, when the US and its Western allies were holding him directly accountable for chemical weapons attacks in Syria and the United Kingdom. Putin never imagined that the nerve agent attack on the former Russian spy Sergei Skripal and his daughter would be tied in with allegations that the Russian-backed Assad regime was using poison gas against Syrian civilians in Douma near Damascus. The Russian president suspects that Israel struck the T-4 airbase, a shared Syrian-Russian-Iranian air facility, as an advance foray on behalf of the US for testing Moscow’s reaction to a larger operation. He is therefore pushing back strongly against the Israeli attack to ward off a US sequel. On the ‘Ezekiel 38 Alliance’, or Gog-Magog, political front we need to note the recent summit in Ankara between the leaders of Russia, Turkey and Iran. Most noteworthy is the fact their currencies are ‘tumbling in tandem’, as reported by Asia Times. Close on the heels of the summit Iran’s supreme leader once again spoke about their intentions of removing Israel. On arriving in Damascus on Tuesday his senior adviser, Ali Akbar Velayati, bluntly stated, “Israel’s air strike on the Syrian air base will not go unanswered,” he said, At the same time Tehran gained support from its Russian ally in the visit of special Russian emissary on Syria, Alexander Lavrentiev. In a long meeting with Iran’s national security adviser Rear Admiral Ali Shamkhani, the Russian said Iran’s decision for a military response to the T-4 attack was understandable. He proposes combining Iran’s action against Israel with Russia’s plans for countering the forthcoming US-British-France operation in Syria (Moscow-Tehran link up to strike Israeli targets in response to US-led operation in Syria). Further headlines/reading at Bill Koenig’s World Watch Daily. This entry was posted in Gog-Magog, Israel, Middle-East, News, Prophetic, Russia and tagged Bible_Updates, Ezekiel, Iran, Netanyahu, Prophecy-OT, Putin, Syria, Turkey by Richard Barker. Bookmark the permalink. Do you recall this dream from 4 years ago?